Gravity should have prevented this car crash, as would not placing buildings near roadways. But we’ve figured out how to defy gravity. Photo by Katherine Hodges. “Police closed the street to investigate”. What a waste of time. The investigation will conclude the same way as any other, with one or more of the following contributing factors: exceeding the speed limit, alcohol, a deficiency in someone’s driving skills or knowledge, or some defect in the road (I’m excluding poor road design as it could almost always be better, designed in such a way to reduce the occurrence of poor quality driving). We already know how to fix all of these issues. There are two good websites that provide information about roads, traffic, and their many attributes. One is provided by the Illinois Department of Transportation (IDOT) called Getting Around Illinois (GAI). The second is the Traffic Count Database System (TCDS). Both provide Average Daily Traffic (ADT) counts with TCDS making the information easier to find and presents more of it. The GAI map has an important layer: jurisdiction. With that information you can determine who has “ownership” of a road. 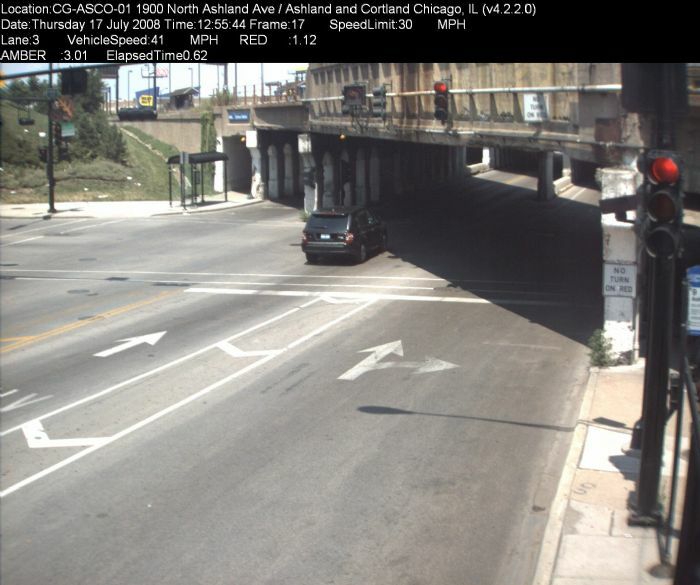 Jurisdiction has been an important factor in the nearly year-long delay of the Jackson Boulevard protected bike lane segment from Ogden Avenue to Halsted Street. IDOT has jurisdiction over this segment (which continues east to Lake Shore Drive; the road is also known as Route 66) and is requiring that the Chicago Department of Transportation do more analysis and revise their designs. If you are looking for ADT counts, I highly recommend TCDS as it uses the more familiar Google Maps and doesn’t require the Microsoft Silverlight plugin (which is slow and often denigrated with poor usability applications). GAI has truck routes and crash information as well. The Chicago Crash Browser as it looks now. This only exists on my laptop and no place else. I can’t put it online because it’s so inefficient it would kill the server. I presented my Chicago Crash Browser to attendees of an OpenGov Hack Night three weeks ago and gathered a lot of feedback and some interest from designers and programmers there. Simplified, the purpose of Congestion Mitigation and Air Quality (CMAQ) grant is to fund projects that reduce congestion and improve air quality. This usually means bicycle, pedestrian, and transit facilities and vehicles. But it also means road projects. Like intersection widening, new signals, changes to signal programming, and “signal interconnect” (timing the signals to cooperate with each other to have some free flowing traffic). It can also mean making grade separations at railroad tracks to eliminate backups when trains cross. However, not everything is infrastructure: there’s also marketing, encouragement, analysis, bike sharing, and education. In a conversation I was having last night with some transportation advocate friends, one joked that most of CMAQ funds road projects. I agreed (probably because the irony of reducing congestion by making higher capacity roads was funny to me), and we moved on to other topics. I set out verify the actual distribution share for the six-county region in Northeastern Illinois. I spent almost an hour converting the Chicago Metropolitan Agency for Planning’s CMAQ 2012-2016 projects list from PDF to Excel and then quickly identified every project as being “road” or “not road”. I tallied the amount of proposed CMAQ funding for the projects to get the answer: road projects take up 25.7% of CMAQ funding. But I can’t stop there! Now that I have CMAP’s data in a spreadsheet, I can get the average of Daily VOC eliminated for road and non-road projects, as well as the estimated cost per VOC kilogram eliminated. On average, non-road projects have a lower cost per VOC kilogram eliminated ($4,109.37 versus $9,472.90). And non-road projects on average eliminate 19.7 times more kilograms of VOC daily (5.918 kg versus 0.301 kg for road projects). There are some disclaimers! These are all estimates and not every project has received funding. Also, projects are not selected solely on cost per kilogram of VOC eliminated, or daily VOC eliminated. I’d also like to see estimates on the number of people affected by each project. You can check my math by downloading my modified projects list (XLS).